Mashable recently put up this story about how Apple's cash (and short-term investments) has grown to $81.5 billion. 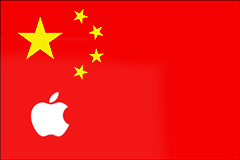 According to the article China accounted for 2% of Apple's sales in fiscal 2009, but that number has jumped to 12% this year. "I've never seen a country with as many people rising into the middle class that aspire to buy products that Apple makes," says Apple CEO Tim Cook.